On the wide and silent plain, darkening the bright daylight, she turns midday into darkness. People look upon each other in anger, they look for combat. Their shouting disturbs the plain, it weighs on the pasture and the waste land. Her howling is like Iškur’s and makes the flesh of all the lands tremble. No one can oppose her murderous battle — who rivals her? No one can look at her fierce fighting, the speeding carnage. Engulfing water, raging, sweeping over the earth, she leaves nothing behind. At her loud cries, the gods of the Land become scared. Her roaring makes the lesser gods tremble like reeds. At her rumbling, they hide all together. Without Inana the god An makes no decisions, the god Enlil determines no destinies. Who defies the mistress who is supreme over land between the mountains? Cities reduced to ruin mounds and haunted places, shrines become wasteland. A deluge. An earthquake. A windstorm. A total eclipse. Four thousand years later you can still sense the awe and terror. Enheduanna looked upon the ruins of ancient cities, already dead two thousand years, and pictured a goddess’s wrath. 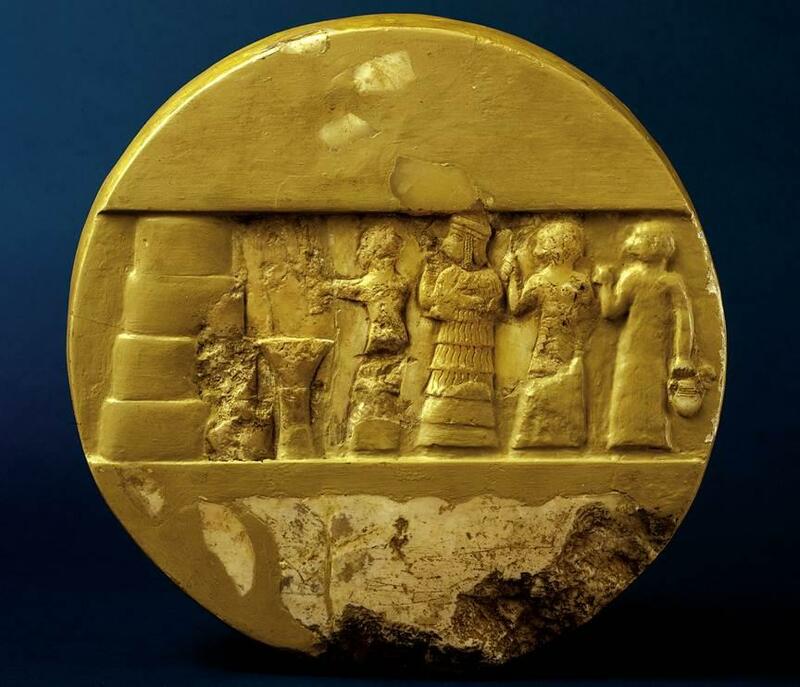 Even in her time the plains of Mesopotamia were littered with vanished civilizations. Without history, each would have been evidence of some unforgiven sacrilege. Hubris, perhaps, or worshipping the wrong gods. The result is always the same. Ruin mounds and haunted places, she writes, and shrines become wasteland. That, as they say, is some writing. A votive disc of Edheduanna, carved in her lifetime. She is at center. This entry was posted in Prose and tagged Akkad, Edheduanna, Exaltation of Inana. Bookmark the permalink.